macOS High Sierraの「Month 13 is out of bounds」エラーにより、MacのCPUやメモリ使用率が上がったりバッテリードレインが起こる可能性があるもよう。 | AAPL Ch. From @tgray: “I started getting the high CPU usage today because of UserEventAgent. It also uses a huge amount of RAM (30+ GB if I let it run long enough). Force quitting and rebooting changed nothing. I did a sample of the process and saw a ton of lines dealing with dates. When I changed the date to November my CPU usage went back to normal. You can try to set time and date manually: https://t.co/hOlnt1MOfm . In a terminal command: "sudo date 010112092018 && sudo killall UserEventAgent lsd". Worked for me at the moment, but after a restarts you have to do this again. 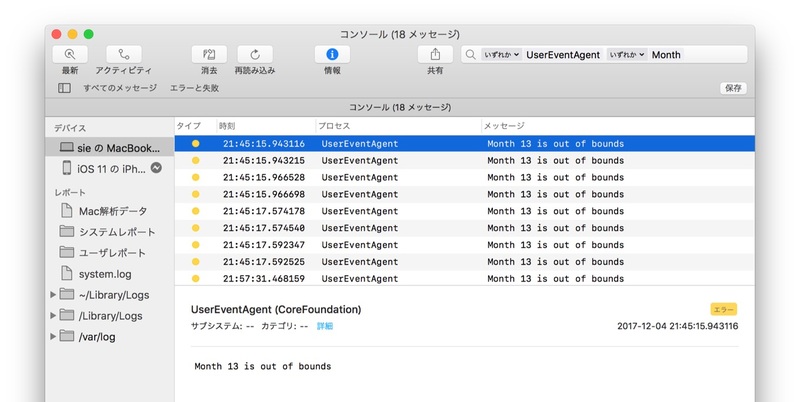 @AppleSupport Tons of "Month 13 is out of bounds" error messages in Console. I *think* it is causing UserEventAgent to use 100% CPU and tons of RAM (>30 GB). Lots of troubleshooting, only resolution is to reset date to November, and force quit UserEventAgent.